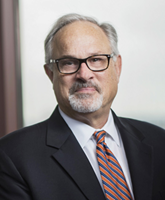 Bob Glenn has represented lenders since 1973 and has handled commercial, industrial, real estate, and asset-based lending transactions, as well as virtually every kind of loan enforcement litigation. He has written on such topics as insolvency and lender liability and has lectured in seminars and programs for bankers, lawyers, accountants, and business groups. He has represented lenders, lessors, trustees, committees, and debtors in Chapter 11 cases and has extensive experience in mortgage foreclosures and lender liability defense.